Pop up camping trailers are great for camping. Comfort on wheels; a luxury type tent for camping. You just tow it to your campsite. They are like a cross between a tent and a RV, and come in various sizes. For those who aren't sure if they like camping or you just want more comfort you are sure to enjoy the experience. No sleeping on the ground, or the need to cart cots or mattresses, or kitchen tents and dining furniture. These pop up trailers have a bottom half like a RV with a tent on top. The tent top is hard, with soft sides that fold down into the trailer bottom, making it compact for towing. When you reach your campsite you park, raise the top, and pull out the sides. They come with a compact kitchen (fridge, stove, and sink), a dining area, that usually can convert into a bed, and different size sleeping sections. The larger ones can come with a bathroom, but the ones' I have been in did not. They were rented for 1 time usage while visiting the USA during 4 different camporee events. Below are an inside picture and floor plan of a large camper trailer with a bathroom. The open length is 27' 9” (8.5m). These campers can cost thousands of dollars and more depending on the size and make. For those who cannot afford a new one try a used one, or rent one to try it out first. I have never set one up. The rental company delivered and set them up for us before we arrived. 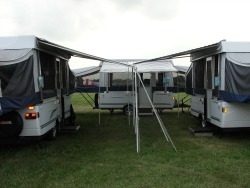 See this video for a basic example of how these tent trailers set up. 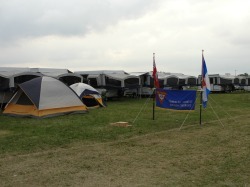 These trailers are sometimes referred to as tent campers, but there is a difference.